Laser Cut Weather Station, made from 1/8″ birch plywood. Hand Painted. The map is in a 3-D layout, the lakes are designed with layers to give the feeling of depth. I built a box in the back to allow for the depth, it also makes room for the weather station parts to fit. You can see with the one element removed that I had holes in the back of the box. This allowed for humidity and temperature changes to be accurately read. The piece was cut on a 100 watt Epilog laser. The material is 1/8″ Baltic Birch plywood. The lake inserts are hand painted and the surface with the text is lacquered in a matte finish to bring out the wood grain. I designed the border of the piece to have a sort of ‘Television’ shape. I wanted the piece to have a mid-century feel. I really like Art Deco and Mid-Century so those two themes tend to show up in a lot of my designs. I don’t know if I have the original laser designs still, but if I do anyone is welcome to have them, just ask. 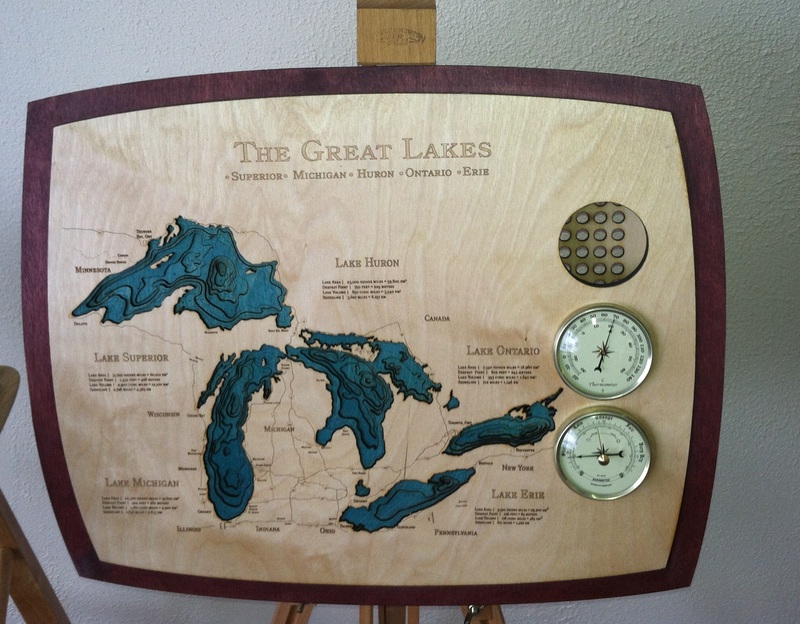 This entry was posted in Crafts and tagged arts and crafts, birch plywood, crafts, creativity, Epilog, Laser Cut Weather Station, Laser Engraver, Vintagier. Bookmark the permalink.